Disposable wipes can cost up to $8 per packet. Using an average of 2 packets per week for 2 years, this Cheeky Wipes kit can save you up to $1500 (over a 2 year period) and a LOT of landfill. On top of that, you have the peace of mind knowing these are safe on babies skin. Hassle free - cloth wipes are much easier to use than disposable wipes and 1 wipe is enough to clean the messiest of nappy changes! 1. Fill the Fresh Container with water and add a few drops of the Fresh Essential Oil. 2. Place cloth wipes into the container, turn them over a few times so they are moist, then the wipes are ready to use. 3. Fill the Mucky Container with water & a few drops of Mucky Essential Oil. 4. 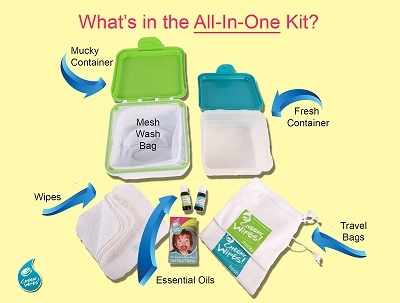 Place used wipes into the Mucky Wipes Container with the Mesh Wash Bag inside. 5. Simply take the mesh bag out of the container and place it straight into the washing machine. No need to touch the used wipes! * Single-clip lids are easy to open and close with one hand (you can safely hold your child on the change table). * Internal hooks keep your Mesh Wash Bag open and drip free (fill water level). * 10 ml bottle Lavender/Chamomile or Mandarin (fresh oil blend) act as a natural preservative so your wipes can stay moist for 2 - 3 days. * 10 ml bottle Tea Tree and Lemon (Mucky oil blend) provides natural antibacterial properties. Add a Hands & Faces Kit for the COMPLETE Cheeky Wipes System. This is the second kit for our house, with #2 arriving; last kit is still going strong 4 years later! White wipes are still washing fresh and barely stained (food) after 4 years. Keen to try the rainbow wipes out!! Great system, and has saved money and the environment!! Highly recommended! So far so good! Easy to use and already much less waste. Usually only one wipe needed per change which is fabulous, not as much washing as I had anticipated. Simple and effective reusable system! I bought the all in one kit and have been using it with my now 7week old little girl and it’s been great! Pleased with how straightforward this system is. I have used almost 1pk of disposable wipes only for extra soiling (the cheeky wipes would do a grand job of cleaning it up though). No nappy rash, and always easy to use! Makes caring for Baby and Environment simple! The system makes using them so easy and feels good that we're not adding to landfill every nappy change! Honestly, this system is so excellent. If you are about your babes bum and the environment you absolutely must have these. So easy (even easier than disposable wipes because this system works wonders one handed). Thanks Cheeky wipes, we will 100% be telling all our friends. Wish I had ordered sooner! I am due with #2 very soon, and having done part time MCNs with my son, I was keen to use cloth full time with this baby. I had heard about the cheeky wipes system and it really simplified the cloth wipe process for me. Whenever I pull out my out and about kit my friends are seriously impressed! They wipe up my toddlers yucky bottom so easily, most of the time I only need to use 1 wipe. Love the bamboo velour too. It’s so soft even just with water. They wash beautifully and have stayed nice and white. Highly recommend them and my only regret is not buying them years ago!! This is a great pack, I love the cleaning/washing systemit is so neat. The oils work really well and smell lovely. The cheeky wipes system is easy to use and has become a firm favourite for cleaning up bub, bums and sticky fingers!